This is my first time visiting museums at night. 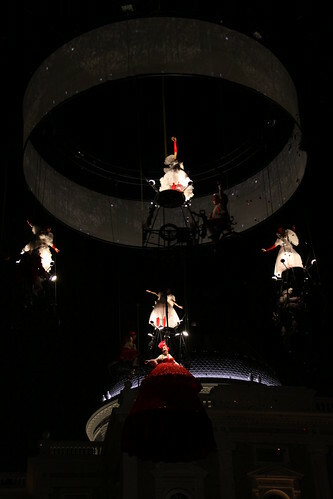 This year is different because the event festival will last for two weeks, from 26th August to 3rd September 2011. Different performances will be scheduled on 2 weekends. Do download a copy of the programme guide from National Museum of Singapore if you do not wish to miss out any good shows. Exhibitions at SAM are much light hearted and colourful. You will first be greeted by several Volvo cars at the front lawn of SAM, flashing rhythmic lights through the frosted windows. It’s a pity sound design has not been considered. It would be a great medium to use with light. 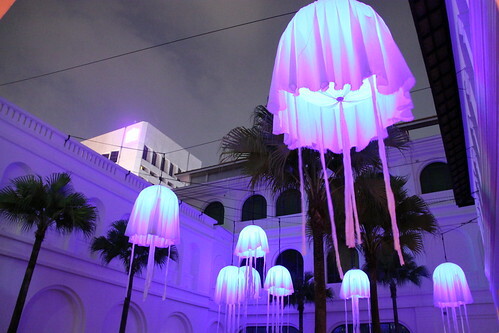 Curiosities are glowing jellyfish light installations floating around 2 sides of SAM courtyard. These jellyfishes are relatively big and fascinating against the dark sky. Definitely a great spot to take a photo with. I would recommend SAM for kids as there are galleries and activities suitable for them to participate in. 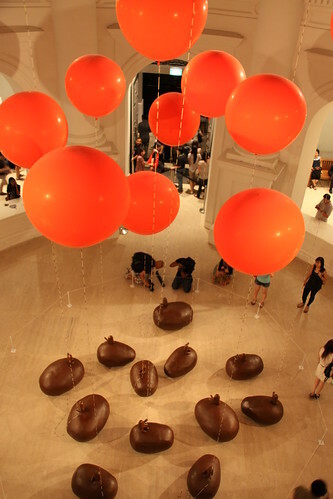 Walking over, to National Museum of Singapore, you will first see 12 large bright helium balloons when you enter the Rotunda. Artist tries to address her dilemma in search for her identity in foreign land. Did you read that? Probably take a closer look at the facial expressions of the gloomy brown figurines juxtaposing against carefree balloons. If you are a photography lover, you must visit Abbas, 45 Years in Photography exhibition located at National Museum of Singapore’s basement Gallery 2. These black and white photography are curated with concerning themes such as wars, countries, day-to-day life and religion. Every picture you see makes you ponder what kind of life these people are living in, what are their stories, what exactly happen back then. This exhibition shall be ongoing till 18th September 2011 (Sunday). I ended my visit of the night with Corazon de Angeles in Paradise performance, in front of National Museum, and also the highlight of the night. Roads are blocked for audience to stream into the temporary open space. 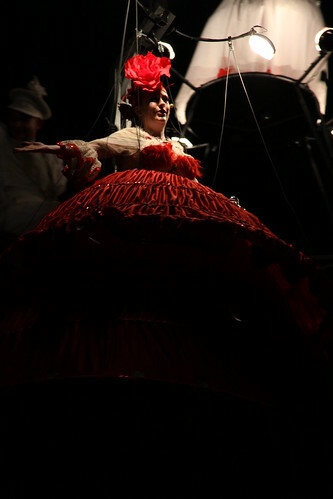 This Belgian theatre company brings the emotion to the peak with their singing, acting, video screening, dance, theatrical props and lights, all performed LIVE. A full 45 minutes experience which transport you to their cinematic world. Note: Within the month of August 2011, admissions to most museums are free. But late night free admission is only applicable to National Museum of Singapore, Singapore Art Museum, SAM at 8Q on 26 August (Fri), 27 August (Sat), 2 September (Fri), 3 September 2011 (Sat), from 6pm to 2am. The Peranakan Museum and The Substation will only open till 2am on 26 August (Fri) and 27 August 2011 (Sat). Would you be willing to link back to me in your post? Thanx already and good luck with your blog.